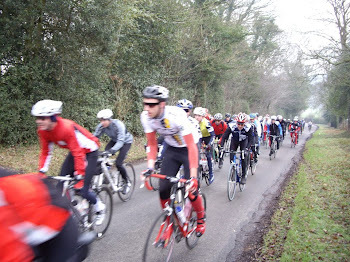 I had my second ride out with the Dulwich Paragon cycle club this weekend, which involved a 35 mile ride around a standard route the members do every Saturday morning at 9am on the dot. I joined the quickest of the three groups, as I thought it would be a great indication of where I currently am, in terms of my own ability. Luckily, I managed to keep up with the group, even though the quicker members of the group did have to wait occasionally for a handful of us mere mortals. I had a moment on this ride where I actually considered dropping off and waiting for the intermediate group to sweep me up, but I managed to overcome my own mind and kept on pedaling. The members of this group were potentially much, much quicker than I was, which shouldn't be much of a surprise considering a lot of them are active racers. But like in the Tour De Nock a few weeks back, I was amazed at how they seemed to be able to crank up the cadence and pull away when climbing and when on flats. But in each of the articles I have read, the constant no.1 point seems to be - 'What is your ultimate goal?' This is something I am yet to set in concrete, which is likely to hinder any long term progress I make on the bike. I mentioned this to Rob (my housemate) on Sunday morning. I can't seem to work out how serious I want to get with cycling. I seem to live and breathe cycling at the moment, I am in love with my bike and I live for getting out into the countryside and cycling for miles. But what I plan to work out in the next couple of weeks is whether I see cycling as a casual/social event or if I intend to attempt to try and race for a team one day.